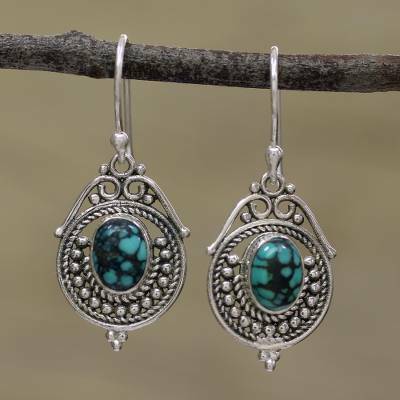 Sterling Silver and Composite Turquoise Earrings from India, "Majestic Circles"
Indian artisans use sterling silver to handcraft two circular dangle earrings, elaborated with bubble and rope motifs. Parul presents these majestic earrings, fitted with ovals of purifying composite turquoise. You can find sterling silver dangle earrings 'Majestic Circles' by Parul in jewelry categories such as Turquoise Earrings, Reconstituted Turquoise Earrings, Silver Earrings, Sterling Silver Earrings and Dangle Earrings. Enjoy exploring these sections for other Novica treasures.